For decades, cheap fashion retailers such as Zara, H&M, Adidas, GAP, and Nike have been supplying shoppers with affordable, on-trend clothing and accessories. H&M, with a 2016 revenue of 21.7 billion US dollars, represents the second largest fashion retailer in the world. With figures evidencing clear financial success, this global corporation has also been subject to huge bouts of controversy and criticism in relation to their integrity (or lack of), when it comes to their behind-the-scenes production in developing countries. This opens a whole can of worms for the label, asking whether their profitable merit is truly deserved in light of their rumoured, questionable manufacturing processes. On their eponymous website, the Swedish-founded H&M states profusely that they do not own any factories, with all their garments being a result of production via independent suppliers. In disclosure of this information, H&M are able to avoid direct responsibility, and arguably any potential negative repercussions, of the particular working conditions of providing factories. It is, however, the choice of the company to decide which suppliers they coincide with. In 2012, H&M was condemned for their absence in attendance at an international hearing regarding the working conditions of Cambodian textile factories. Part of this discussion circulated around the fact that nearly 300 workers had fainted in just one week, within the factories then certain circumstances. 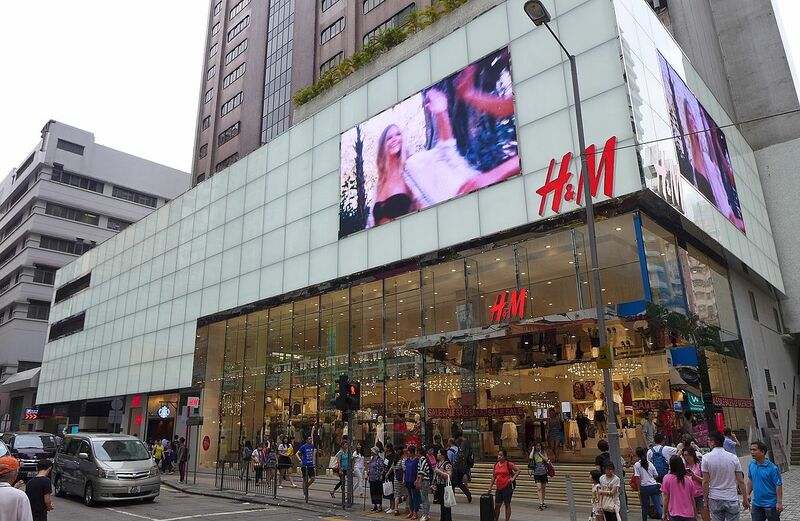 H&M dismissed the incident as a case of ‘mass hysteria’, provoked by personal stress of the employees. Paradoxically, 2013 saw H&M announce a business prospect, in aim of achieving ‘living wages’ for their textile workers in Asia by 2018; wages that would cover basic living requirements, as well as leaving room for additional money to be saved. Thus far, specified wages for the workers in H&M supply factories is determined by the Fair Wage Network, and varies between countries. H&M themselves do not divulge in exact amounts received by the workers. In January 2017, a published report by SOMO contained interviews from labourers in Bangladesh. The workforces indicated that the basic wage was not enough to make ends meet without having to work overtime. Nevertheless, unlike most fashion corporations, H&M does provide information concerning 98.5% of its primary suppliers, including the addresses of these. This then becomes an enquiry as to whether these factories are willing to make known their own working conditions, or allow visitors to speculate. In the documentary ‘Sweatshop: Deadly Fashion’, four Scandinavian fashion bloggers visit Cambodia with the mission of revealing the truth behind H&M’s supplying factories. Although the group are given explicit permission of a tour by the brand, they are later denied access from every factory they attempt to visit. Despite such controversial and seemingly unorthodox, immoral practices naturally associating themselves to H&M, it is not wholly fair to categorise them as being an entirely unethical brand. Within it’s 71 years of business, the brand has in fact provided more than 1.6 million jobs through their suppliers, and do claim to be working towards more equal, fairer employment in developing countries. Besides labour-related issues, H&M is working on the use of 100% recycled and/or sustainable materials by 2030. Additionally, since 2015, the company has commenced collaboration with a new, supplier assessment program, permitting them to work towards improving their standards in line with a number of social justice practices. Whilst exuding some form of positivity for onlookers in terms of ethics, these initiations should not overshadow the dire working conditions in which thousands of underprivileged employees continue to face. It is, unfortunately, a matter of greater global importance which goes way beyond the responsibility of one, lone brand. The fashion industry, amongst many other denominations, continues in their paths of exploitation, taking advantage of those in poverty and providing the bare minimum in order for fat cat business men to revel in profit. As consumers, it’s critical for us to be aware of where our clothes and other products originate, and the social injustices that may coincide with it. For more information regarding ethical shopping and how to be conscious, please visit www.ethicalconsumer.org. Next articleThe Great Debate: Remembrance Day?